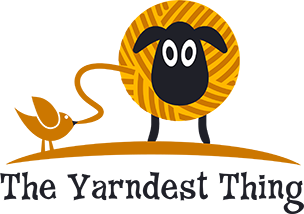 the yarndest thing: Crackin' the "WIP"
Ok, so if you love knitting or crochet it's expected that you're going to have multiple WIPS going on at the same time...but to stop pretty much at the end? It's very unlike me to do that, but I am guilty of setting this sweater tee aside for a good amount of time and completely forgetting about it. I must have had too many things going at once. Shocker, lol! ;) This was another "inbetweener" design I put together just for me. I don't intend on publishing this at the moment, so I thought I'd share it on the old blog. I'm currently focusing more on accessories as far as pattern ideas go, so forgive my lack of posting. So, it's time to do the final touches and give a gentle wash just in time for the lovely and welcome chill of winter! This is a top down raglan tee worked with 1x1 rib (I know, yikes that's a lot of ribbing), but it form fits the body without any need for midriff shaping, which made for a nice relaxing knit. You may also recognize one of my favorite Aran panels running down the center...I've used it on a tote as well as my Eventide pullover. 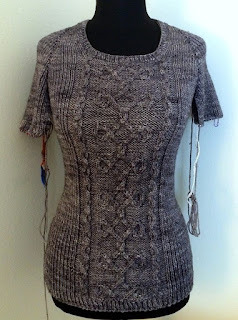 In case you were wondering, this little number was worked in Tosh DK, colorway Tern.